"Minaret" narrates the downfall of a wealthy Sudanese family through the voice of their twin daughter, Najwa. Najwa's downfall started with the arrest and execution of her father in Sudan during a coup d'état. Consequently, she fled to England with her twin brother and mother. In England, her mother was diagnosed with a terminal illness while her twin brother, as a result of his drug addiction, was arrested and jailed. "It was becoming clear that I had come down in the world. I had skidded and plunged after my father's execution and through my mother's illness, when I dropped out of college, then after Omar's arrest and through my relationship with Anwar....We didn't know we were being exiled, we didn't know we were seeking asylum.... She employed me as a maid and I became one. I was a servant like the servants my parents had employed"
As was to be expected, Najwa was emotionally and physically chattered. She was desperately seeking to be healed as well as regaining her sense of belonging. Fortunately, she found help in Islamic religion. Where she eventually found solace, guidance and peace of mind. "I would leave the mosque refreshed, wide awake and calm, almost happy.... I reached out for something new. I reached out for spiritual pleasure." Moreover, she came to accept her current situation by putting the past behind her. Only in her dreams did she go back to Sudan to relish the life she had once lived and had always desired. Aboulela's works I read in "Gods and Soldiers" and "African Love Stories" compelled me to purchase her novel. I am glad I did. Her characters, mostly females, are subtle, delicate, subdued (kind of) and at the same time strong spirited. 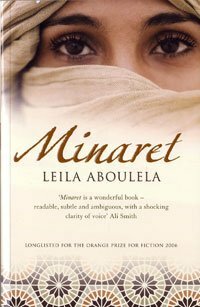 "Minaret" was beautifully written. I found it realistic, though-provoking and engaging, that I kept on thinking about it days later. Quite an emotive read. Najwa gave an intimate account of her spiritual journey towards accepting her comedown. Finally, this novel gave me a whole different perspective on the Islamic religion. One of my favourites, I look forward to reading more from Leila Aboulela. She is such a talented writer. I highly recommend. Long listed for the Orange Prize for Fiction 2006. Any book that stays with you for days after reading it is wonderful. Hello, I have lyrics Alley on my shelf waiting to be read. I hope to enjoy it.